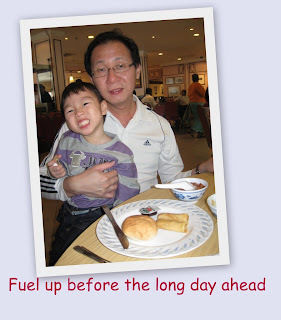 We planned to start off as early as possible as we had a long day of Theme Park fun ahead. Normally we need not set an alarm clock cause we have a 'living alarm clock' who will always tell us "It's morning time, wake up". This time, I guess due to the previous late night & the comfortable bed, Baby G slept later than usual and didn't wake up. By the time we were ready for breakfast, it was almost 9am. 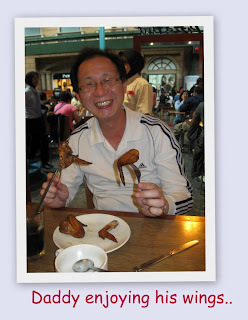 As the accomodation came with a buffet breakfast, we went down to the Happy Valley Restaurant. 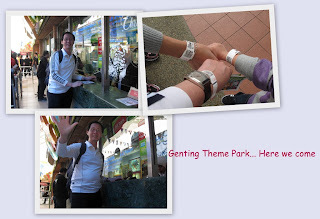 After breakfast, we went to buy our day pass for the Indoor & Outdoor Theme Park. Since the weatherman predicted intermittent rain, we decided to go for the outdoor rides before it started to rain. After 2 rides, we started on the 3rd ride called 'Antique Car where you can 'drive' and the car will take you around the Theme Park area. Baby G enjoyed this one the most cause he thought he was really driving the car, although the control was at the foot pedal to keep the car moving along the tracks. Just about 3/4 of the way, it started to rain cats & dogs. Although we were sheltered by the car roof, we still got kinda wet. Once we got off the car, we bundled Baby G into his raincoat. 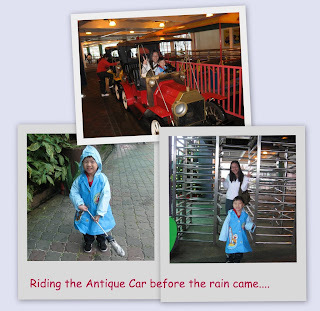 Since it was raining pretty heavily, some of the outdoor rides were stopped so we had no choice but to go for some of the indoor rides. 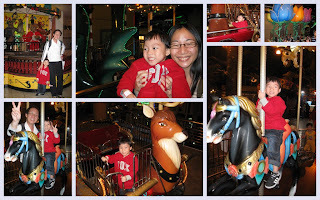 We came across the kiddy bumper car and thought that Baby G would enjoy it. However, for this, there was a height limit, so only Baby G could ride the car and no parents were allowed. This time, I still cautioned Baby G from getting off the car since there were going to be so many moving cars around and more dangerous that the Safari Jeep. However, I wasn't as worried as previously. The moment the gate opened to let the kids in, Baby G rushed in and got into one of the cars. Looking at him, I thought he'll be able to drive around. 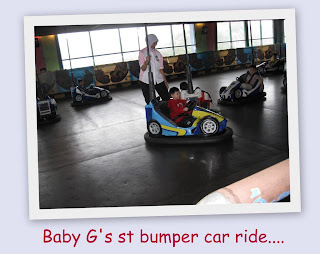 Who knows, Baby G didn't know how to step on the pedal and his was the only bumper car that was not moving and yet being bumped into. He kept turning his steering wheel and looking a bit bewildered as to why the car was not moving even though he was turning the wheel furiously. It was quite a hysterical sight to see the bumper car stranded. In the end, the attendant went over to his car and helped him to step onto the pedal so that his car could move. After the bumper car, we decided to give Baby G a break and went onto more sedate rides. 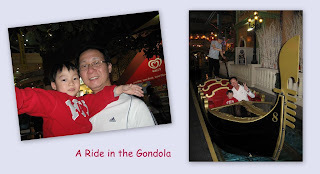 We went on the Ferris Wheel (Singapore Flyer to Baby G) & the gondola ride before going for lunch. 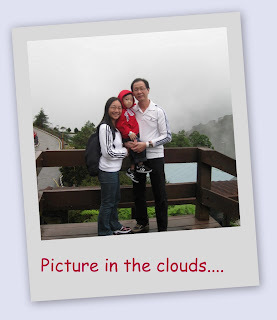 Just nice, after lunch, the rain also took a break. We quickly went out again to check out more outdoor rides. We found the Space Shuttle & Dinosaurland. After the Space Shuttle, life will never be the same for Baby G. He got scared of this particular ride. I guess it's because we were in the dark the majority of the time & we were all alone & there was this alien creature that suddenly rised up during the ride. Baby G was quiet throughout the ride except for a few "I don't like this" & "I want to go out" soft cries. He was very subdued when we exited. 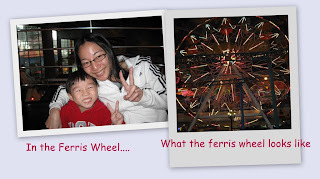 To calm him down, we took an outdoor version of the ferris wheel. 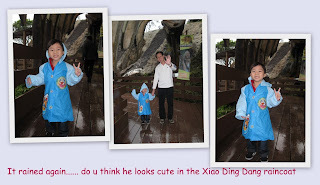 After a while, he became much better and we went on to Dinosaurland. 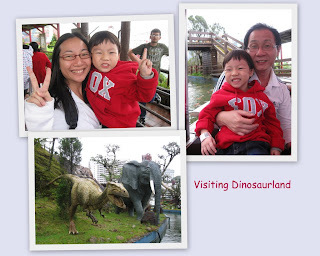 As the Dinosaurland journey ended, it started to rain again. Since we couldn't do much, we decided to go for dinner instead. 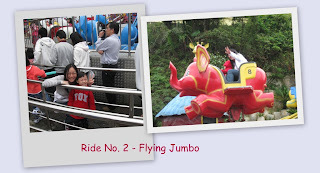 After our simple yet fulfilling dinner, we continue with a few more rides before calling it a day. What an exhausting yet exciting & fun day. Tomorrow will be another day of fun & lots of travelling.